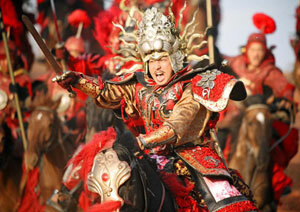 (left) Jang Dong-Gun and Cecilia Cheung, and (right) Hiroyuki Sanada in the fabled Crimson Armor. The Skinny: When you consider its Internet reputation as a bonafide celluloid stinker, The Promise actually isn't quite that bad. The Golden Globe nomination for Best Foreign Language film is a bit puzzling, though. Easily the most entertaining and gorgeous train wreck of the year. Another legendary Chinese director tries his hand at SFX-enhanced wuxia with The Promise. Chen Kaige co-wrote and directed this garish fantasy, full of daring visuals, generic characters, and more than a few mystifying moments. The result is part beauty and part beast; an attractive yet lumbering art-house fantasy that will engender either "love it" or "hate it" reactions. If the Internet is your guide, then "hate it" may be the prevailing emotion, as The Promise is being absolutely killed on many a BBS or forum. But The Promise also scored a Best Foreign Language Film nomination at the Golden Globe Awards, indicating that someone (in this case, the Hollywood Foreign Press Association) actually thinks the movie is good. Who's not seeing the full picture here? Probably both sides, as The Promise is neither brilliant nor all-out bad, though its success is likely linked to just how forgiving or tolerant the audience is of its fantastic excesses. In the first twenty minutes audiences get a taste of just how unbelievably excessive The Promise can be with an action sequence featuring slave Kunlun (Korean actor Jang Dong-Gun) running alongside a raging stampede of bulls. Kunlun starts the chase on his hands and feet, but soon graduates to running upright, a sign of his upcoming transformation from submissive slave to proud man. Even untrained film readers should note the symbolism, but what's more noticeable are the god-awful visual effects from Hong Kong effects house Centro Digital. Combined with the bright costumes and cartoonish acting, The Promise certainly looks like it's going to be a stinker. But things calm down somewhat after the plot starts to kick in. Kunlun is hired to be the personal slave of General Guangming (Japanese actor Hiroyuki Sanada), a celebrated and ruthless warrior wearing magnificent gold and crimson armor. Guangming is called back to the capital to protect the King from the forces of Wuhuan (Nicholas Tse), a preening prettyboy who's after the King's girlfriend, Princess Qingcheng (Cecilia Cheung). However, the Goddess Manshen (Chen Hong) shows up out of nowhere to tell Guangming that the man wearing the Crimson Armor will be responsible for the King's death, and will become a national pariah. Guangming scoffs at her prophecy, but after an unsuccessful assassination attempt by Wuhuan's pet assassin Snow Wolf (Liu Ye) leaves Guangming injured, he sends Kunlun in his place - wearing the crimson armor. The King ends up turning on Qingcheng, and seeing a woman in peril, Kunlun kills the King. Kunlun's massive error sparks a convoluted love triangle. After saving Qingcheng, Kunlun becomes enamored of her. However, since Qingcheng believes Guangming was her savior, Guangming takes advantage of her misinformation by claiming credit, the benefit being that he can romp in the sack with Qingcheng. Hiroyuki Sanada and Cecilia Cheung get a highly-publicized and somewhat hot (for a Chinese film, anyway) love scene, which could account for Sanada's frisky onscreen demeanor. Of all the actors, Sanada seems to be having the most fun as the roguish Guangming. On the other hand, Jang Dong-Gun is all business playing a frustratingly dopey character. Kunlun is a bit of a simpleton, and the fact that he runs all over the place at top speeds makes him seem like the Asian version of Forrest Gump. As Guangming continues to fool Qingcheng into sleeping with him, Wuhuan plots his revenge, and Kunlun sprints to and fro across the countryside in search of his true identity. By the way, Kunlun can also run fast enough to travel through time. By now, half the audience has begun laughing hysterically. The other half? They might be intrigued, if not entertained by all the silly stuff happening. The Promise is an all-out fantasy, in that it makes up its own rules for its world, and simply asks the audience to buy in, or suffer the consequences. The consequences are thinking that the movie is lame. The benefit of buying in: diversion, if not actual entertainment. The Promise is a spectacle of the highest order, though the line it walks between entertaining camp and laughable crap is so thin that it requires real work not to become totally alienated. The film is filled with many touches that feel more suitable for comic books than big-screen pageantry, and at times the film seems to acknowledge it. 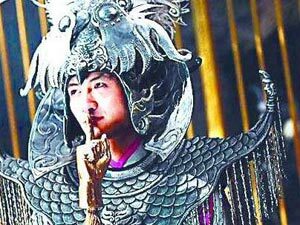 Nicholas Tse's performance as Wuhuan is entertainingly campy, and his character's silly costumes and accessories only enhance that. Kunlun's ability to run through time is also another silly conceit - though it's acceptable if you remember that this is a fantasy. If one goes in thinking that The Promise will be nothing more than entertaining fantasy crap, then extreme disappointment might be averted. Unfortunately, steeling yourself for the worst can't fix all of The Promise's problems. Its status as a fantasy can excuse some of the film's silliness, but the world Chen Kaige creates is still too simplistic. The world of The Promise feels too confined and unfinished to be properly convincing. The politics and society make no sense, and there are no glimpses of anything remotely "normal", e.g. average people or non-soldiers. Everything about the world seems to exist to cater to the four main characters and their intertwined destinies. A good fantasy should create a living, breathing world beyond the confines of the film frame, and The Promise fails at that. Furthermore, Qingcheng is a startlingly unsympathetic character. Presumably, the audience is supposed to care who she ends up with, but even her cursed existence (according to the Goddess Manshen, Qingcheng won't know true love) is not enough to create sympathy for her. Cecilia Cheung looks magnificent and emotes valiantly, but she also gives Qingcheng an icy demeanor that's hard to get by. In the end, it's questionable if she manages to make the character worth caring about.  Audiences love The Promise! Or, they're at least laughing a lot. Reportedly, screenings of The Promise in Hong Kong have been greeted with howls of laughter, plus the occasional exclamation of "What the hell?" This did not happen at Kozo's screening, though seeing Nicholas Tse brandish his wacky finger on a stick accessory did get people cracking up.  The Promise has been optioned for North American release by the Weinstein Company, run by former Miramax honchos - and sworn enemies of Asian Cinema - the Weinstein Brothers. Ironically, the film's new title, Master of the Crimson Armor, may suit the film better as it's less pretentious-sounding than The Promise. Whether that induces North American audiences to regard the film more charitably is another story entirely. Unfortunately, they also edited the film, trimming it from 121 minutes to 97 minutes.  Whoops. After working to retitle and trim The Promise, the Weinstein Co. apparently returned the rights to Chen Kaige and company in late December 2005. The result is no mega-push from a Hollywood major as the film jockeys for a Golden Globe award and an Oscar nomination. The U.S. title, Master of the Crimson Armor, has also been dropped in favor of The Promise, though it's the cut version that's up for the Golden Globe. Further confusing matters, the original version is the one being submitted for Oscar. What isn't changing: the mixed response from audiences.  Take two: after The Promise got dumped by the Weinstein Co., it was picked up by Warner Independent Pictures for a limited North American release starting in May 2006. Reportedly, the film has been trimmed down to 102 minutes from its original 121, and may even have a new beginning and ending to make things "less confusing" for viewers. However, given the general hatred for the film, it's questionable if the Asian Cinema faithful even care anymore about what happens to The Promise.